Alternative names are listed above in the entries for the various species sharing this name. PROTO POLYNESIAN *Puka-tea, Pisonia grandis (Nyctagynaceae). 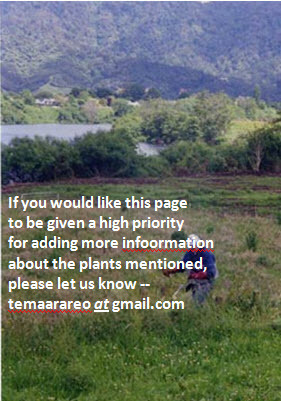 Puka: A name applied generically to a select number of species having in common a littoral or damp habitat and relatively large leaves, including, among others: Meryta sinclairii "Puka" (Araliaceae), and Griselinia lucida "Puka, Akapuka" (Griseliniaceae). 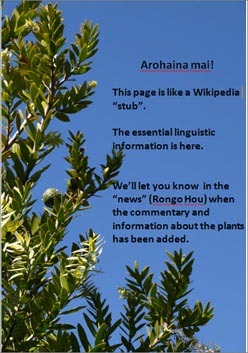 References and further reading: See linked pages and general works on NZ trees and other native plants in the bibliography.